Mushroom Wars 2 is a delight. Designed around accessibility and simplicity, it is in principle a real-time strategy (RTS), but nothing like Starcraft or Command & Conquer, which people usually associate with the term. Rather, it’s the kind of game that anyone, at any level of expertise, can pick up and enjoy… but don’t let that fool you. Play this in multiplayer and it will spur the competitive spirit to the point that you’ll risk losing friends. In the most delightful manner, of course. 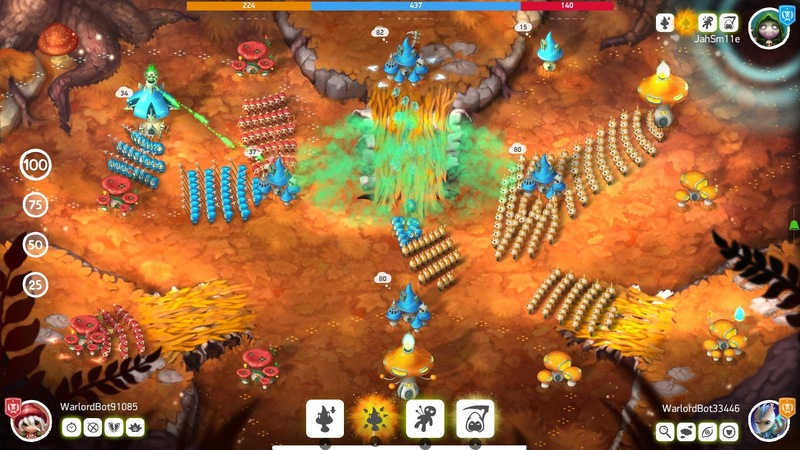 Mushroom Wars 2 boils the RTS formula down as far as possible. You’ll have “bases” which automatically generate new soldiers over time. You then need to direct those soldiers to capture opponent’s bases. The first person to capture all the bases wins. Of course there are some additional features to give the game some semblance of strategic depth; you can “spend” soldiers to level up bases so they produce more quickly. You can also capture or build fortresses or workshops, which don’t generate soldiers, but auto-attack invading armies from range, or power up your soldiers, respectively. You’re also able to select a “hero” to lead your forces, and those heroes each have their own unique set of special abilities. These can be used once an energy bar gets to a certain size, and those powers can turn the tide in a battle, so they need to be used well. Finally, your units get more powerful the more battles you win and bases you capture. Their “morale” improves, represented in-game as stars, but if you get lax the morale benefit starts to fade. In other words Mushroom Wars really encourages players to be aggressive and penalises conservative play. Those extra features do add depth to Mushroom Wars 2, but never at the expense of simplicity. I really do mean that anyone could pick this game up and understand it in less than half an hour. Another half hour play latter and they’ll be comfortable cruising through the single player levels. Of which there are a lot. In terms of raw content Mushroom Wars 2 offers two meaty single player campaigns, each with dozens of levels to play through and four different difficulty levels to master. The game shows its heritage as a free-to-play mobile title by charting progress through the accumulation of “stars” – each difficulty level provides an additional star to the tally – so the game is painfully grindy at times. 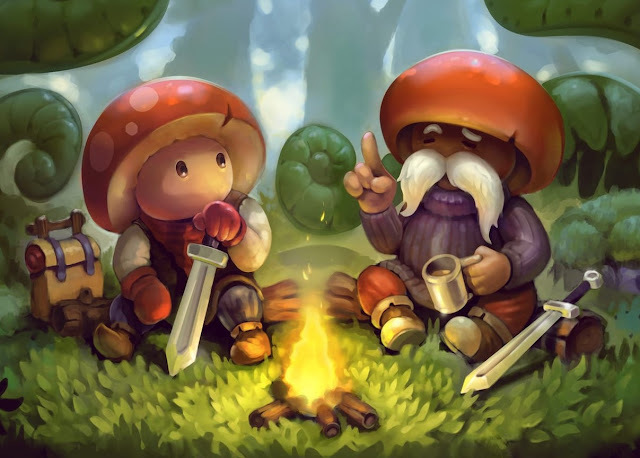 There’s also a lack of storytelling to give the action context, which is a pity because the art and design of Mushroom Wars 2 is so delightful it would have been relatively easy to come up with some kind of lighthearted narrative to compliment the on-screen action. But the single player levels aren't the real strength of Mushroom Wars 2. 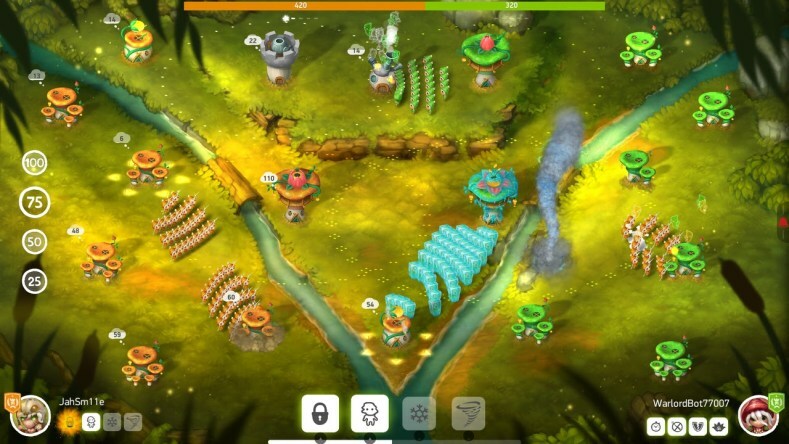 Mushroom Wars is all about the multiplayer, which you can play both locally and online. 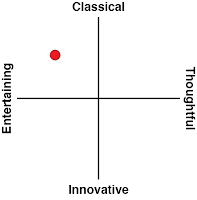 The multiplayer is all about quick wits, and clever feints. Target an enemy building with some soldiers, and while he/she is busy trying to protect it, figure out where the weaknesses are, and send some other troops that way. It’s about using your character’s special powers at just the right moment, and making sure you’re the one with the workshops and guard towers to find that extra edge. It’s a gloriously well balanced multiplayer experience that feels entirely fair at all times. None of the dozen or so heroes feel like they’ve got an overwhelming advantage with their skills, so in the many matches I played online I didn’t come across the one hero over and over again. And because human intelligence has that ability to think creatively, unlike AI, I saw a surprisingly varied range of tactics in Mushroom Wars 2’s multiplayer, given the simplicity of the game’s structure. 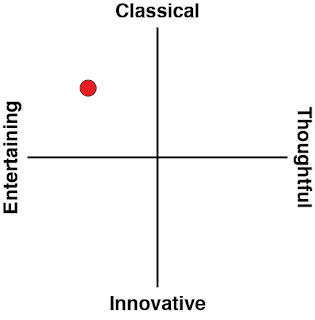 The range of modes is impressive, too. Play 2 v 2 if you’d like to work with another player, or a 4-player free for all is manic fun, as well. Online there’s ranked matches, and I hope this game sustains a community, because there’s a lot of potential there for ranged games to become competitive. The only downside to the game is that a “come from behind” win is all but impossible. Because Mushroom Wars 2 is so simple in structure, once one side gets an edge, it becomes very difficult to avoid being overrun by the other side. The side in the lead is building more troops, they have higher morale, and aside from a really clever use of hero powers, there’s not really any way to turn that kind of advantage around. In the time I’ve played, once one side has an edge in Mushroom Wars 2, the inevitable happened in all but one case (I was able to use a particularly powerful ability which turned enemy soldiers into my allies to counter a major mass attack that my opponent did, which left him open to a counter… and left me with a lot of new troops). Every other time it was just a case of slowly dragging the loser through a war of attrition. Mushroom Wars 2’s developer shouldn’t feel too bad about that though, since it’s a feature of most competitive strategy games that have some kind of “progress system” within a match. Even in the mightiest games, like League of Legends, once one side has earned a small advantage (i.e. one side had characters at a slightly higher level than the other), it becomes incredibly difficult for the other side to catch up, and the leading side can start the glacially slow process of rolling forwards towards the opponent’s base. Admittedly I don’t watch a lot of professional League of Legends, but I did play it solidly for a few months, and in that time I rarely saw a come from behind win. It’s only when you get to titles like Europa Universalis or Nobunaga’s Ambition, where numerical force size isn’t so critically important, that the underdogs can out-strategise the leaders, and the only way to achieve that is to offer players complex systems. Mushroom Wars 2 just doesn’t have (nor does it want) that kind of depth. On the plus side, matches in Mushroom Wars 2 don’t drag on nearly as long as in some other titles, so if you do find yourself on the losing end, the pain doesn’t last too long. Mushroom Wars 2 is the ideal casual strategy game. It has the potential to be much more than it is – the lack of a story to go with the gorgeous characters and art design is unforgivable – but nonetheless this is the perfect example of how to make something simple and elegant, while leaving just enough in there for people to feel like their strategic brain muscles are being flexed. 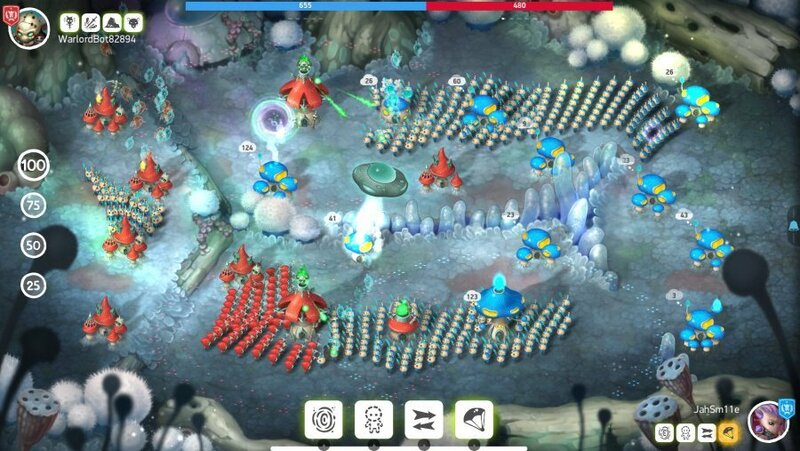 As I said at the outset, Mushroom Wars 2 is a delight.